Last night, I had the honor of participating in an event celebrating local history – and the people who endeavor to preserve it and share it with others. The event’s host was the Mechanics’ Institute Library & Chess Room (an awesome, quirky, historic organization in and of itself – check it out, attend an event, be dazzled by the incredible spiral staircase, become a member). 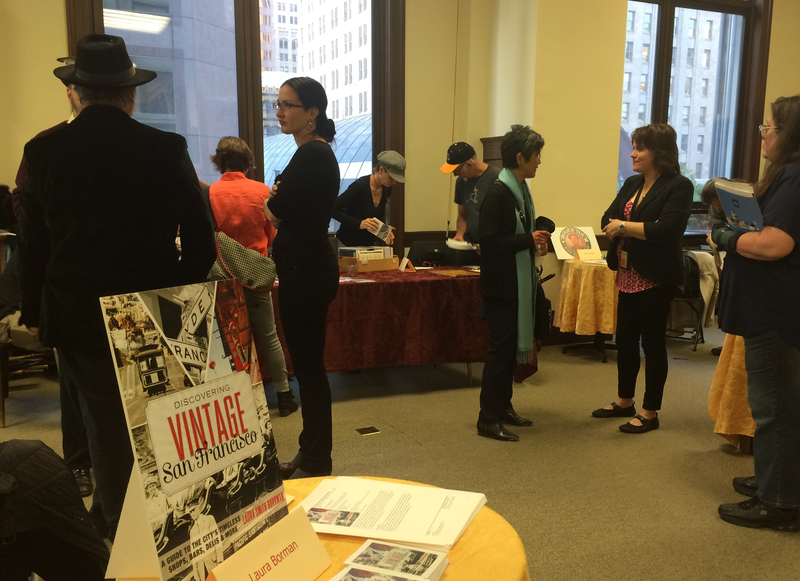 “Our Story – A Bay Area Heritage Open House” brought together authors, academics, artists and aficionados to talk about what they’re doing to document San Francisco’s unique cultural heritage. Exhibitors ranged from archivists and eccentric performers to tour guides, coin collectors, government workers and young tech geniuses. Some attendees were fervent history buffs with dedicated documentation projects of their own, others were simply passers-by with an interest in local culture. And they were all pretty awesome. In many ways, I felt unworthy. I am simply a writer. An interviewer. A storyteller. Not a trained historian. But my passion for sharing the stories of the region and the people who’ve shaped it over the years placed me there, and it was exhilarating to meet so many people doing interesting things to help maintain what is special about the area and what has made San Francisco the place it is today. The folks from Odd Salon, History Pin, the California Historical Society, National Park Service (Gina Bardi is a fascinating combo of reference librarian and sketch comedy performer!) and Western Neighborhoods Project captured my imagination best – and they were just the tip of the iceberg in terms of the range of interests and talents represented in that room last night. I urge you to check them out, celebrate local history and do a little something to help preserve it. And in the spirit of the event, I’d love to hear what that may be! Please share a bit about your projects, or local family history, or, simply, stories about vintage San Francisco in the comments here. Previous Previous post: New Book Coming Soon!